If you didn't watch the Monday Night Football game between the Green Bay Packers and the Seattle Seahawks, you missed one of the most egregious errors made by fill-in referees. The final moments of that game were no doubt exciting as the Packers tried to seal the win with an apparent interception. When Packers safety M.D. Jennings caught the football in the end zone, Golden Tate from the Seahawks also got his hand(s) on the ball. One official ruled it an interception, another official called it a touchdown. Both officials were seen with two different gestures! It was insane. The final ruling by referee Wayne Elliot indeed ruled the play a touchdown and the Packers lost the game. Twitterverse was on fire for much of the game and exploded after the refs settled on the touchdown call. The National Football League on Tuesday released a statement admitting the error, but upholding the final ruling. 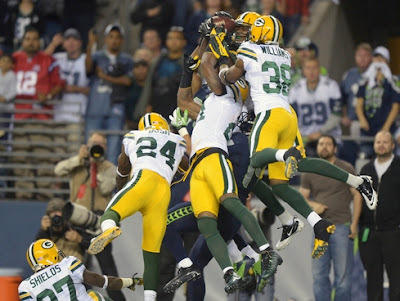 The statement, cited in a report by USA Today, said the ruling should have been nullified because of the pass interference penalty that refs missed when Golden Tate shoved Packers defensive back Sam Shields in the back before leaping for the football. The NFL said the penalty would have ended the game declaring a victory for the Packers. Rule 8, Section 1, Article 3: The player catching the pass (whether offensive or defensive) maintains possession as he "touches the ground inbounds with both feet or with any part of his body other than his hands." Item 1 of the same article reads the player "must maintain control of the ball throughout the process of contacting the ground, whether in the field of play or the end zone. And Item 5 of the same rule states, "If a pass is caught simultaneously by two eligible opponents, and both players retain it, the ball belongs to the passers." [BUT,] "It is not a simultaneous catch if a player gains control first and an opponent subsequently gains joint control." Judging from that final item, one could see that Jennings from the Packers had the ball in both hands and Tate with the Seahawks then gained simultaneous possession. At any rate, the NFL's final ruling is what it is, a touchdown that helped the Seahawks win. So many people are calling for the heads of the replacement referees, even President Obama tweeted that the league should stop the lockout and give the referees what they want. What do you guys think? SPEAK!